"I'm totally addicted to using lavender as flavoring. If you think it sounds weird, may I suggest not knocking it like I did until you try it." Preheat an oven to 350 degrees F (175 degrees C). Grease an 8x12 inch baking dish. Make lavender sugar by blending the sugar and 2 teaspoons lavender buds in a blender; blend until the lavender is powdered. Blend together with an electric mixer 1/4 cup of the lavender sugar, butter, coconut oil, 2 cups flour, and salt in a bowl until a dough forms; press into the bottom of the prepared dish. Bake in the preheated oven until the top begins to turn golden brown; about 15 minutes. While the dough bakes, mix together the remaining lavender sugar, 1/4 cup flour, eggs, lemon juice, lemon extract, and 1/2 teaspoon lavender buds; pour over the baked crust and return to the oven to bake until the center is set, about 20 minutes. Allow to cool completely and dust with confectioners' sugar before serving. These were very good. I have an essential oil company. If you don't like the texture of the lavender buds, you can add a couple of drops of high quality lavender essential oil to the recipe. I too love lavender, and these bars were great! 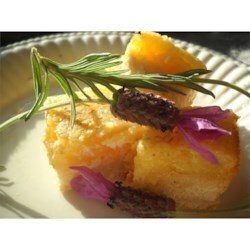 I know a lot of people don't consider lavender something used for food, but i LOVE it! These were awesome! The hint of lavender with the lemon was great. Will definately make again. very easy to make and very, very good. Had my daughter and her friends taste them. Raves for more.